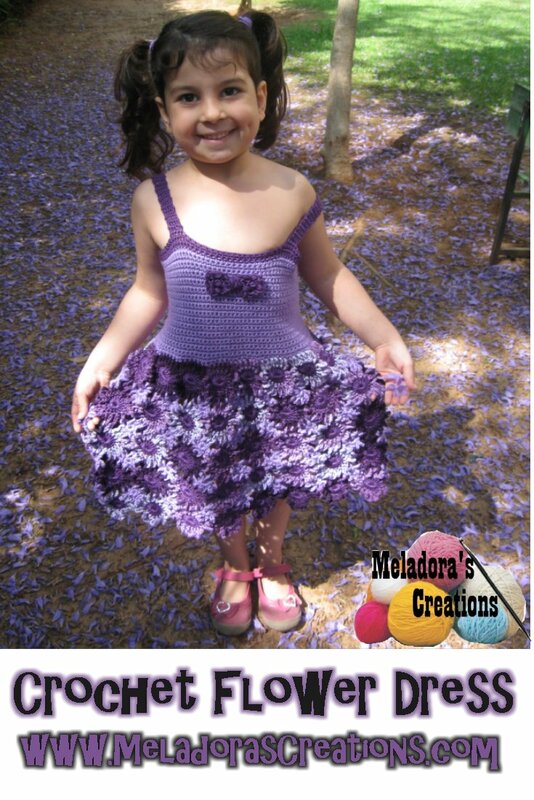 This Free Crochet pattern teaches you how to make a Crochet Flower Dress for a child of 5 years old. But this pattern can be adjusted very easily by adjusting the amount of flowers in a circle made at the start. See details in video to learn how to measure for sizing. 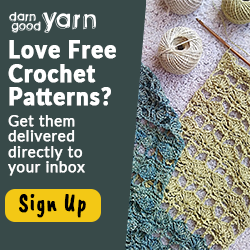 YARN: to get 100 gram skeins of soft acrylic or cotton yarn. COLORS: 2 variegated, 2 light purple, 2 dark purple. 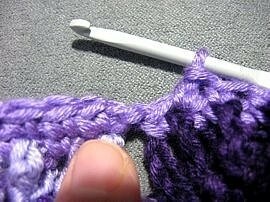 You will also need a tapestry needle to work in ends. And buttons, I used 5 two centimeter buttons. I made mine for a 5 year old, if your making it for a larger child, you may need more. 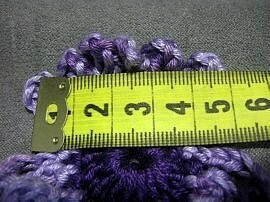 You will also need the measurements of the child your making this for. 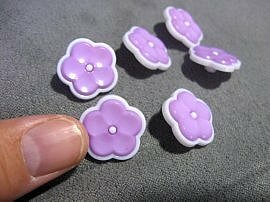 Measure around the biggest part of the chest or belly of the child so you know how many flowers to make. Each flower measures 5 centimeters or 2 inches wide. So if it’s like my daughter who measured 55 centimeters around, then 5 / 55 = 11 so I need at LEAST 11 flowers. So take your minimum number and add 6 flowers to it, so my total number of flowers is 11 + 7 = 17 flowers total. 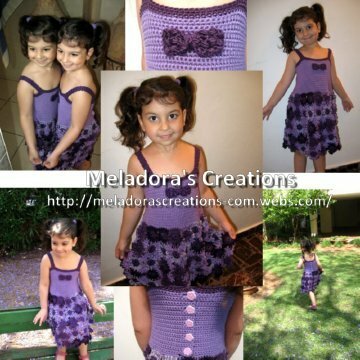 Once you know how wide, you also will need to know how long to make the top of the dress. So measure the child from her under her arms until mid belly. Also measure her from under her arms until just past her knees for full length. Also measure from the middle of her shoulder to the other middle of the shoulder so you know how wide the straps need to be from one another. Last thing you need to measure is for the strap of the dress, so measure from her under arm to over the shoulder to the other side of the under arm. Once you have your numbers we can get started. You now know how many flowers you need right? So lets get to making the centers! Repeat what’s in between * for rest of round. 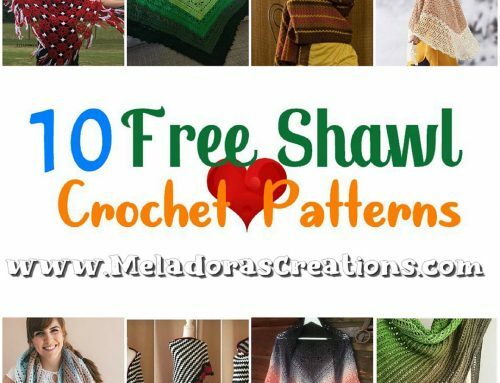 All my patterns are free on my site so I am very honored if you wanted to support my channel by buying a PDF version of my pattern on Ravlery Or my shop on Etsy here Thank you very much! Be sure to come to my Facebook page to ask questions if you get stuck. Grab your darkest color or the color you wish to use for the center of the flowers and chain 4, sl st into beginning ch to form a ring. Ch 1 and DC 17 inside the ring, sl st into the first DC of the round, ch 1 and fasten off your yarn. I like to figure out how many I need total in flowers and make all my centers first. 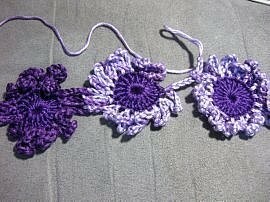 I need 17 flowers for 5 rows so 17 X 5 = 85 so I’ll be making 85 centers first. 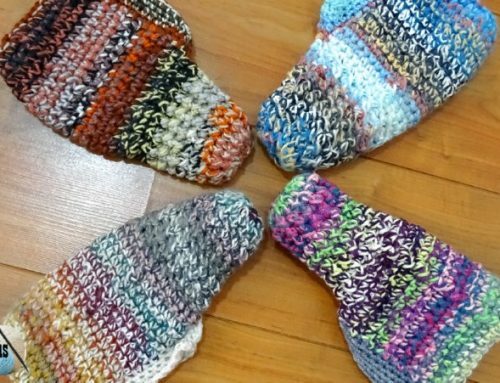 Change colors to your variegated yarn here. To make your first flower take your circle and sl st the color you chose for your flower petals into any DC st.
Ch 9 and sl st into the next st to the left, ch 9 and repeat all the way til you get to the end, you should have 16 petals in total. Ch 1 and fasten off your yarn. To make the second flower and the remaining flowers for the first row you will need to make it like you did the first flower, only stop after the 15th petal chain, do not attach the 15th petal to the center of the flower YET you need to stop and give yourself a tail of about 150 cms (meter and a half) or about 59 inches of yarn and then cut it, because you are going to need to do some weaving. Take your 15th petal ch and weave it into one of the flower petals of the first flower you made, then sl st. Ch 9 and weave it into the next petal on first flower. Sl st and ch 1 fasten off. Continue doing this for the remaining flowers on this row. I used 17 flowers total. 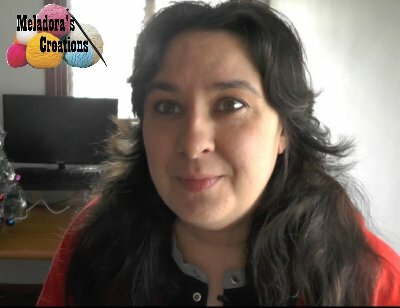 Once you come to the last flower of your round you will need to attach to form a ring.How to do this is the easiest way is, I made my flower and stopped at the same point as the other flowers I made and cut my yarn. but then I ripped out my petals til the 7th chain. Each flower should have 6 petals on the top and 6 petals on the bottom. With 2 petals connected on each side of the flower. All flowers should be connected like this. So, leaving 6 petals on top, I connected and weaved in the 7th and 8th chain. 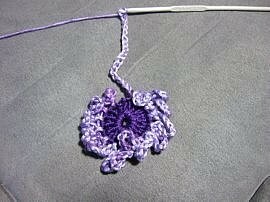 Then crocheted my next 6 petals and worked in my 15th and 16th petals into the other flower to form my ring of flowers. You need to start by changing colors to your lightest color. 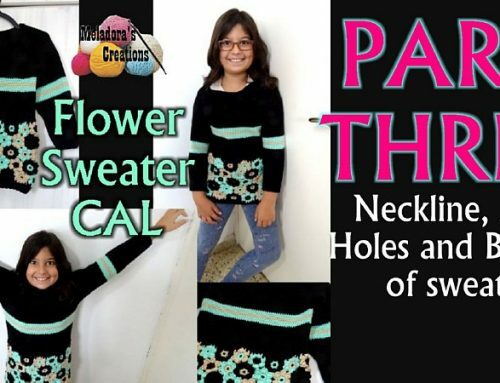 Attach your yarn with a sc attachment and start to sc into every loop of the flowers. Each flower has 6 loops on top, so make sure to sc in all 6. Continue until you get back up to your first sc of the round. When you get to the beginning sc, do not go into it, but ch 1 and turn your work and sc back the other direction. Then ch 1 and turn and work your way down the SCFD sts. Sc all sts. Sc into the next 2 stitches then, sc 2 into button space and sc rest of stitches. sc as normal but when you get to the end, repeat rounds 4 and 5 on how to make the button hole. I made a new button hole every 6th row, but if you have bigger buttons, maybe you want to do it every 8th. Just be sure to lay out your project flat. See your goal of how big you need to make the top and how you would need to space out the buttons. I needed 15 cms total, so I spaced out my buttons to be about 2 cms apart. So depending on how big the person is your making it for continue this way, repeating rows 4 – 10 until its as big as you need. 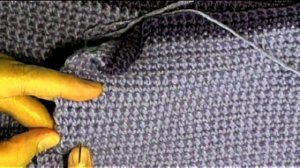 Once you have your last button hole made that you need, ch 1 and turn and sc one more row with this color, when you get to the end of the round, change to your dark color, or color you used for the center of your flowers and do 3 rows of sc for the top trim of the dress. Once you have the top of your dress all done, now is time to sew on your buttons. Just line it up to the hole and sew them on. Always be sure to check each button as you go that the buttons in a good place and that your flowers down below are facing the right way! I recommend keeping the button in the button hole to help hold your work straight as you attach the others. I started sewing mine 3 rows over from the end and tried to keep this that way. 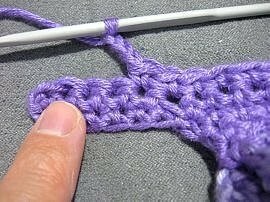 Keeping with the darker color, take the measurements of the shoulder to shoulder and using markers, set them apart where your not supposed to crochet, so from mark A to mark B is open space for the neck. Now starting from the front side, left marker and sc attach your yarn, this will count as your first sc. Sc into the next 4 to 5 sts, depending on wide you wish to make your straps. Continue to sc and ch 1 and turn at the end of the row until the strap is as long as you need. We will want to make the strap about 3/4 ths the measurement if not less than you measured. It will prevent the straps from falling down on the child, so they really need to be as short as you think you can get away with. So you will stretch your strap as much as you can to measure it. See how a 12 cm strap can turn into a 17 or longer when worn? You want to end on a odd number row, then turn your dress inside out and on the back side where you want to attach it, find your marker, and counting from the mark, count over 5 sts and this is where you want to line up your work. 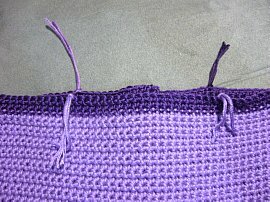 Ch 1 and go through your strap stitch first, then through the top of the dress and continue doing your sc connection. 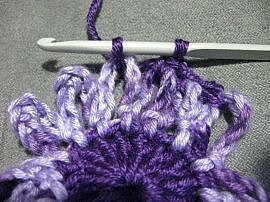 Ch 1 and cut your yarn leaving a tail to be worked in later. Repeat for other strap connection. To connect the 2nd flower and all inside flowers, make the flower like before, only this time stop after the 11th flower and do not connect # 11 chain yet, first weave it into the second flower from the top, using the two bottom petals, leaving two open petals to the left on the top flower, (You will need the two loops for later) sl st to join and ch 9, sl st to make petal numbers 13 and 14, ch 9 for petal 15 but weave it into first flower of the row, leaving two petals in between as seen in picture below. It’s important to leave two petals in between each connection for the connector pieces later. When you get to your last flower, to connect it to form a ring, I recommend making the whole flower and then ripping it out until petal 7 like you did before. Weave petals 7 and 8 to the flower on the right, each flower has 6 petals on the side you will be using the two middle ones, so these are where you will be weaving your petals into. then connect petals 13 and 14 to center of flower and weave petals 15 and 16 into the correct flowers on the left to complete the circle. You will repeat this for 3 more rows, giving you a total of 5 rows of flowers. Ch 4 and sl st into beginning ch to form a ring, ch 6 and then leaving yourself about 150 cms (meter and a half) or about 59 inches of yarn and then cut it. Continue around till you have all 8 petals connected. Continue to do this to all the open loops in between, making sure you grab all 8 petals, leave no loose ones. Then your done with the dress! Now all you need to do is make the bow on the front. 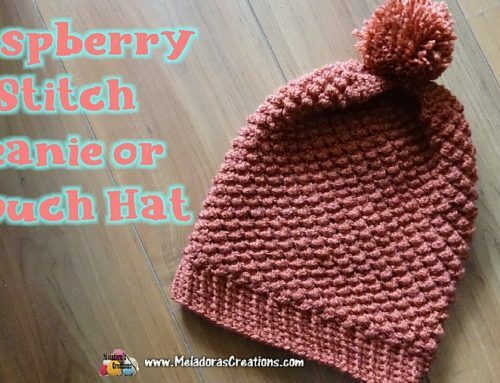 It’s from the pattern here if you want to make one.